Lake house designs take full advantage of their surrounding views by including many windows and outdoor spaces. Whether a getaway vacation cottage, extravagant waterfront estate or somewhere in-between, lake homes of all sizes and styles boast enchanting warmth and inviting casual living floor plans. If you desire a dwelling on a lake offering scenic views and tranquility, look no further than these lake house designs. The Weslan Narrow Lot Home has 2 bedrooms, 1 full bath and 1 half bath. 981 Sq. Ft., Width 27'-0", Depth 39'-0"
The Daxton Sloping Lot Home has 1 bedroom and 2 full baths. 1105 Sq. Ft., Width 27'-0", Depth 29'-6"
The Wulff Modern Narrow Lot Home has 1 bedroom and 1 full bath. 728 Sq. Ft., Width 24'-0", Depth 14'-0"
4435 Sq. Ft., Width 92'-0", Depth 54'-6"
5209 Sq. Ft., Width 60'-6", Depth 64'-0"
See beautiful Lake homes with functional floor plans by browsing this collection. These lakefront homes are ideal for active families who want to have great views and easy access to the lake. 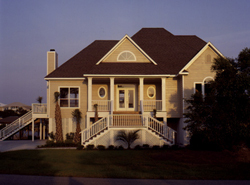 Many of these home plans are designed for sloping lots often found along the shoreline of the lake or coastal waterway.